By sending email campaigns within SalesSeek you have the option of tracking which of your recipients open and which of those click on the links in your email. This tracking of email opens is done via a small image that detects when it is loaded. It allows us to give you an overall statistic of the number of open and click rates for each campaign sent. However, potentially more beneficial and actionable is the live view of those opening and clicking on your emails on the dashboard, or record view, activity feeds. 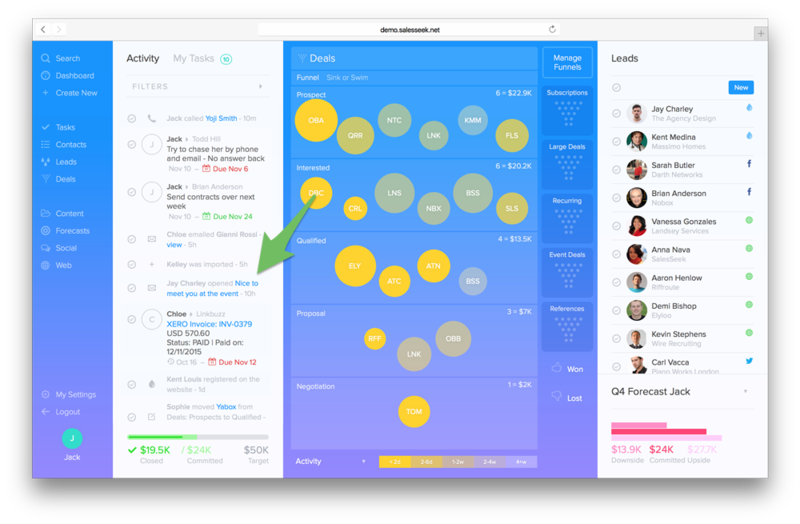 This view highlights when a contact has opened an email, allowing you to react. Knowing who to follow up with and doing so quickly allows you to respond to prospects when your email is still fresh in their mind. This can be particularly insightful if it has been weeks or months from the date when your email was originally sent. An open then indicates that the email has been deliberately reviewed rather than scanned in the general context of their inbox.